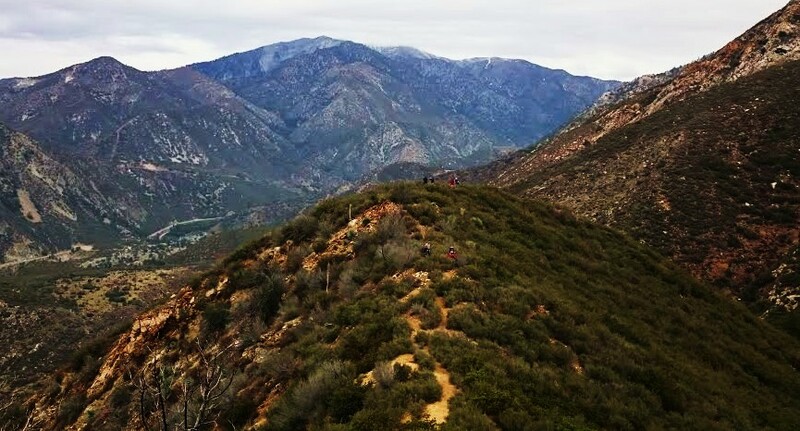 This enjoyable hike offers a commanding tour of the lower San Antonio Canyon. Stoddard Peak is certainly not the tallest summit around, but it provides a unique perspective of the surrounding mountains and a bird's eye view of Mount Baldy Road and San Antonio Creek. Your route is mostly on a fire road, with a half-mile scramble to achive the summit. The peak was named for William H. Stoddard, who established the first resort in the San Antonio Canyon. In 1880, he moved from Sacramento and settled in a shady grove of sycamores and oaks in a lovely, waterfall-laced side canyon (which was later named for him) just east of the main canyon, about a mile above the entrance. Around 1886 he decided to turn his little paradise into a resort, and soon Stoddard's Camp became a favorite retreat for citizens of Pomona, Ontario, and San Bernardino. This hike is most enjoyable in winter or spring when the temperatures are pleasant, the vegetation is verdant, and snow can grace the high country. But it can also be fine in the hot season if you start early before the heat rises and the sun is hiding behind the high ridges to the east. In the late fall you can enjoy a splash of color. See Seasons of the San Gabriels for a detailed description of minding the seasons. From the new 210 Freeway extension, driving east: Exit Baseline Road in Claremont. Turn left (west) on Baseline. In one block turn right (north) unto Padua Avenue. In 1.7 miles turn right onto Mt. Baldy Road (stop sign). After 2.4 miles you pass Shinn Road (an alternate route coming in from the right). Drive another 3.3 miles to the turn-off to Barrett-Stoddard Road on the right. From the new 210 Freeway extension, driving west: In Upland, exit Mountain Ave./Mt. Baldy Exit, Exit 54. Turn right and proceed north on Mountain Ave (at some point it turns into Shinn Road. Drive 5 miles to Mt. Baldy Road. Turn right (north) and drive another 3.3 miles to the turn-off to Barrett-Stoddard Road on the right. There is a large clearing on the right which has been the standard parking area for this hike. However, there have been numerous car break-ins here in the last couple years (as reported to the author in July 2015 by a resident of Barrett-Stoddard Road). It is recommended to drive southeast on Barrett-Stoddard Road about 0.2 mile and park near the bridge. There is also some parking available about another 0.6 mile on Barrett-Stoddard Road near the locked gate (the dirt road is somewhat rough with two stream crossings; high-clearance vehicles are recommended). Previously a National Forest Adventure Pass was required for parking since the area is within the Angeles National Forest. A February 2012 federal court ruling and consequent decisions and rule changes have deemed the Adventure Pass required only in areas such as family and group campgrounds, picnic areas, boat launch ramps, and High Impact Recreation Areas. See here of more Adventure Pass information. Walk southeast on Barrett-Stoddard Road. Shortly the road gently climbs as it contours east around the bend into Barrett Canyon. You cross the creek and turn south as you pass some charming cabins. The thick forest of canyon live oak provides shade even in the winter when other oaks lose their leaves. Just past the last cabin, at 0.8 mile from Mt. Baldy Road, you reach a locked vehicle gate. There is a small wide spot in the road that could accommodate parking a car or two, if you wanted to drive to this point (high-clearance vehicle is recommended). But the walk to this point is pleasant and adds to the overall experience of your expanding view of the canyon. Walk past the gate and continue southward up the road. As you emerge from the oak forest you'll round a bend and begin to cross an open area. All along the route from here you'll see the telltale evidence of the Williams Fire, which devastated much of the area in September and October 2002. As you contour into Cascade Canyon, enjoy views of the exceptionally beautiful upper reaches of the canyon. After you emerge from Cascade Canyon, the road continues south toward your destination. 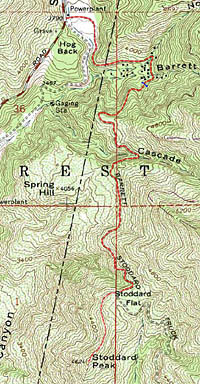 At 2.6 miles from the start, you reach Stoddard Saddle. From here the road begins to descend into Stoddard Canyon. The large, gently slopping area on the left (east) is Stoddard Flat. Looking southwest you'll see the two false summits on the ridge leading to Stoddard Peak, which is out of view at this point. Notice a faint path that heads right (west) through the brush up the steep slope. This is the route you'll take, following the path 0.4 mile, which can be rough and brushy in places, along the open ridge over two false summits (4560+) to reach Stoddard Peak. The peak is marked with a rusted triangular sign which reads "V12." Some hikers stop at the second false summit, which is accented with a large granite outcropping. From Stoddard Peak (4624'), looking west across San Antonio Canyon, the skyline is dominated by a ridge that is a 1,000 feet higher, accented by Clover Peak (5511') and Sunset Peak (5796'). To the northwest, to the right of Sunset Peak, is Cow Canyon Saddle (4523'), Lookout Mt. (6812), and beyond that, Iron Mt. (8007'). Massive Mt. Baldy (10,064') stands majestically to the north. Notice the Bear Canyon Trail as it zigzags up the ridge heading toward Baldy. Looming thousands of feet above you to the northeast is the mammoth west flank of Ontario Peak (8697') and Cucamonga Wilderness. Down the ridge to the immediate south, an unnamed, pointed summit (4324') stands guard over the mouth of Stoddard Canyon (hikers have used this route). To the left and beyond is Frankish Peak (4198'). And on a clear day you have nice views of Upland, the Pomona Valley, and beyond as far as Saddleback mountain and Catalina Island. You can hear car horns honking in the tunnels 1,200 feet below you on Mt. Baldy Road. Notice also fragmented sections of the old canyon-bottom road. Enjoy the summit and then return the way you came. Mileage and elevation - Based on Jerry Schad's work; McKinney has the same numbers (see links below). The elevation gain accounts for a little roller coaster action. Historical information - Based on John W. Robinson's The San Gabriels (Big Santa Anita Historical Society, 1991, pp. 253-254). Highpoint - Stoddard Peak (4624') is certainly not a high summit compared to the surrounding mountains, but it is higher than the highest points of half the states in the U.S. See United States State High Points from peakbagger.com. 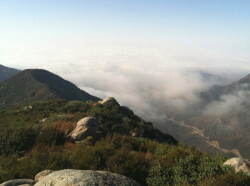 Adventure Hikes and Canvoneering in the San Gabriels by Christopher E. Brennen. "Hike G9. Stoddard Canyon." 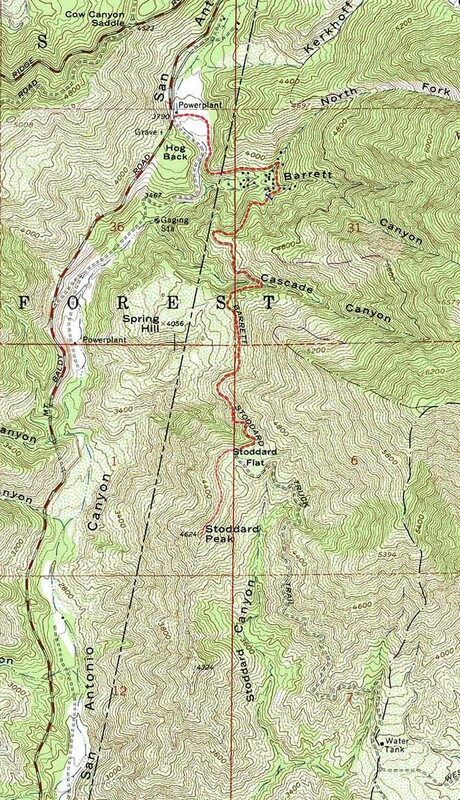 Provides thorough information on a cross-country hike down Stoddard Canyon. This route requires technical skills and equipment. Afoot and Afield in Los Angeles County - by Jerry Schad(Wilderness Press: Berkley). Area A-12, Trip 2: "Stoddard Peak." Good trail description. Los Angeles County: A Day Hiker's Guide - by John McKinney (The Trailmaster, 2006). "Stoddard Peak." Good historical background and trail description. This page was last updated July 30, 2015.